When Do Anime Adaptations of Video Games Work Best? Video games have proven to be a difficult medium to adapt into films. With most falling flat for a variety of reasons, the only medium that seems to be able to handle the content most effectively is anime. Anime adaptations of video games haven’t been all that common until more recently, with shows like Tales of Zestiria the X, Persona 4 The Animation, Steins;Gate, and Ace Attorney being well received. But because it’s a fairly new thing, the ways that anime adaptations of video games are approached can be pretty different. When adapting manga, the general consensus of “it should follow the manga’s story” is pretty common and often leads to a better show, but with video games, that consensus doesn’t exist yet. So should anime adaptations of video games be loyal to a fault, or make creative changes that enhance the story? I’ve already discussed Persona 4 The Animation in the past and I haven’t played the game at all, so that won’t be a fair comparison. The Steins;Gate anime is an arguably better way to experience the story (the game was unbearably slow I’m sorry), so I’m going to focus on Tales of Zestiria the X and Ace Attorney for this comparison. I’ve played the first several hours of Tales of Zestiria but have yet to complete it, so comparing it to the anime is going to be a little difficult. However, even in the first few episodes, Tales of Zestiria the X makes some really interesting, creative changes to the story that enhances it overall. The most significant change is the start of the anime. Tales of Zestiria the X begins with Alisha’s story and her travels, unlike the game, which starts with Sorey and Mikleo exploring the ruins around their home. This is huge for Alisha’s character because she doesn’t get this level of development in the game early on. It allows the audience to understand her struggles and relate with her character more. It isn’t until after she’s an established character that Sorey and Mikleo are introduced, and because of this that her influence on the story becomes more important and relevant. The anime also takes the time to flesh out the story and characters in different ways from the game and make it feel like an organic show. For instance, in the video game, the group travels to a dungeon to receive a weapon for Mikleo. Not only does the anime exclude this trip for the group, the anime uses it as a smart way to develop Mikleo’s character. In the anime, Mikleo travels to this place alone as his way of resolving to help Sorey in whatever way possible. Mikleo’s character arc is arguably more effectively done in the anime than in the video game and serves as a great example of creative changes the anime can make to add to the story and characters. 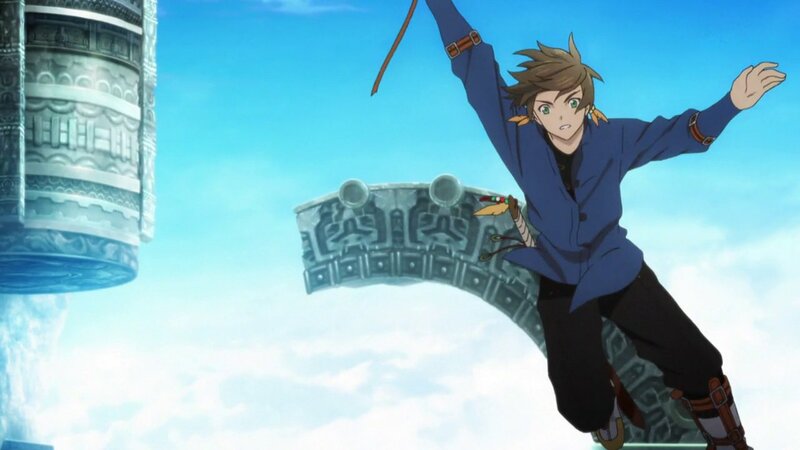 Even a small detail like Sorey having a grappling hook really emphasizes his love for exploring and is a great touch. It’s for these reasons that Tales of Zestiria the X has been so enjoyable to watch. It’s fun to see where the anime and video game cross paths, but also where they diverge and handle content in different yet good ways. It has a perfect balance of staying loyal to the subject matter but also adding or changing certain moments to make them more engaging or powerful with the audience. On the opposite side of the spectrum, there’s the Ace Attorney anime. You guys probably know by now that I love the game series to death based on the past articles I’ve written, and the fact that we even have an anime of this series is so awesome. 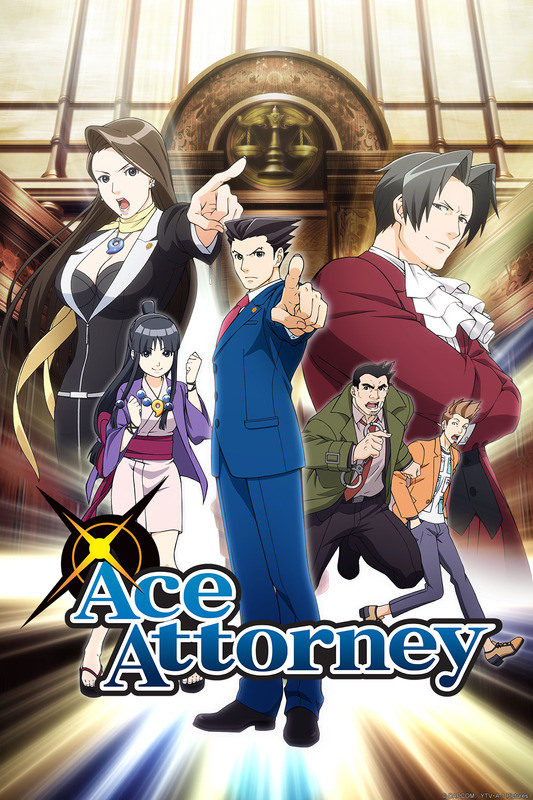 It’s awesome to be able to see some of the best moments from the games in animation, but with that said, Ace Attorney is loyal to a fault, almost too much so. And I hate to say that because the games are great, and the transition they’ve made to animation is pretty good so far. However, there aren’t many moments that are different from the games, besides including adorable moments between Phoenix and Maya which I love, or having characters appear in cameos before becoming more significant later on. But because there isn’t any additional content, the pacing of the show is really fast. It leaves very little surprises for the viewer if they’ve played the games, and for those who haven’t, it may feel rushed and simplistic on the surface. I don’t know if the anime should have changed the content per se, but adding some additional scenes to develop the characters and story would greatly enhance it. As enjoyable as the Ace Attorney anime is, I find myself wanting more from it. Perhaps the best thing about anime adaptations of video games is that at this point, they’re still relatively new. There really is no right answer to how an adaptation can be approached, but it’s worth exploring all of the options. Creative changes, while successful in Tales of Zestiria the X, may not be executed well and other shows and butcher the content. However, being too loyal to a game’s story can also lead to the story not having any surprises or excitement like Ace Attorney. I found myself enjoying moments that weren’t necessarily in the games but added a lot to the characters and story as well. At the same time, there’s something to be said about seeing a favorite moment in a video game being animated and seeing how it plays out. It really depends on its execution and what it adds to the show. My own preferences aside, I hope this trend of video games being adapted into anime continues. Video games have incredible stories to tell, and anime is the perfect medium to tell them in. Can you imagine getting a good anime adaptation of Zelda? Or Chrono Trigger, animated in the same style as its PlayStation cutscenes? 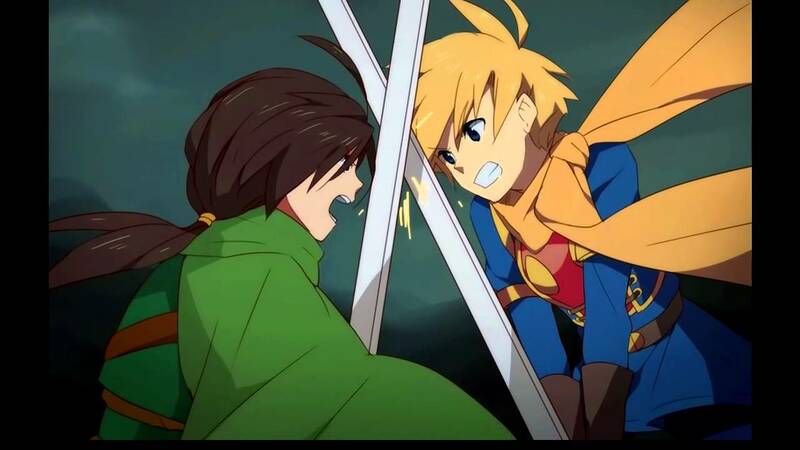 Or Golden Sun, and then halfway through we switch to the other group’s story? Better yet, an anime adaptation of Kingdom Hearts could help the plot make more sense to the people who haven’t been able to play the spin-offs. All of these would be amazing, and my hope is that anime adaptations of video games grow in popularity so that we can potentially get shows like these someday. Great topic and really well written! 😀 Because I’ve always been an anime fan first and later became a gamer, I was always surprised to find out an anime I’ve watched and enjoyed was based after a video game. At the time, when I wasn’t playing video games yet, I actually appreciated being able to enjoy the story and characters as an anime. It did make me wonder what it might be like to play the actual game, but a lot of the time I never got the chance or it wasn’t accessible for me to try it. This is why I’m actually happy with just watching Steins;Gate and never playing the game (I watched the Let’s Plays of the Steins;Gate game you did for the site at one point and I don’t think I’d be able to continue further either because the pacing is too slow). I do want to watch the new Ace Attorney when I finally get the chance, but judging from the screenshots I’ve seen, it does look like the anime took everything from the video games and threw them together to make a series out of it, minus the player interaction. I think for me I wouldn’t mind if the anime isn’t completely loyal to the game it’s based off of. Turning a video game into anime offers a level of artistic freedom to flesh out characters more or make some slight changes to the story to maybe add a new perspective that the game might not be able to cover or hasn’t touched upon. The episodic nature of anime does allow the story and characters to be better written and developed, which I think a movie based off of a game doesn’t really have. Or there will be some parts of a movie that just won’t feel satisfying. This is why I say forget a live action Zelda movie. Make Zelda into a really fun and interesting anime! 🙂 It’d fit as an anime and can you imagine the gorgeous animation? Thank you!! 😀 Yeah, Steins;Gate works much better as an anime than a game. I don’t doubt the game has its moments, but between the lack of an English dub and the very slow pacing, I think our playthrough was pretty much destined for failure (the lack of talking on our end probably wasn’t a good call either). While it would have been cool to see the different endings the game had that the anime didn’t, the anime is the better way to experience the story. The Ace Attorney anime is decent. I wish the animation was better like the cutscenes for Dual Destinies and Spirit of Justice (SOOOO PRETTY!!! ), and I do wish there was more to it. I’m not fully caught up but even within the first several episodes, the pacing is insanely fast. Story arcs that I thought could take up 10 episodes are resolved in 2. Stuff like that. It’s crazy. In the game the faster pace works better since there’s gameplay to break it up, but the anime doesn’t have that luxury unfortunately. I would LOVE an animated Zelda! Live action has proven to be terrible in the past, and animation would be the perfect way to capture everything Zelda’s about. I know Nintendo’s been burned in the past so I understand their reluctance, but giving Zelda a GOOD anime would be really great. Can you imagine an anime adaptation of Breath of the Wild? Amazing! I’m playing Dual Destinies now and I did notice how good the cutscenes are compared to the screenshots of the Ace Attorney anime. It’s like, what happened here? How come the anime doesn’t look as good as the game cutscenes? The cutscenes in the game is already an anime! It’s too bad the anime itself doesn’t have the same high quality animation like Dual Destinies and I’m sure Spirit of Justice has. That still won’t stop me from giving the Ace Attorney anime a look though. So excited for Breath of the Wild! 😀 An anime of that game in the style of Studio Ghibli like that fanmade trailer would be the greatest thing to ever exist!! Because live action would not do the series justice I agree. I remember seeing a fanmade live action Zelda trailer but inspired by Game of Thrones? It was weird and pretty much just reiterated why live action wouldn’t work. Animation all the way!! Excellent thought-provoking article! I’m actually on the camp of enjoying neither of the anime adaptations. I maybe liked Tales of Zestiria the X’s slightly more, but I thought the changes made just confused me or were too slow. To its credit, I think it must be very tough to adapt a 40+ hour RPG, and that’s probably why they only made it through half of the story so far. What I did love was how the action came to life in the anime, especially considering how beautiful it looked. On the other side, I really wanted to like the Ace Attorney anime (one of my favorite game series ever), but its main issues were with its pacing and lack of hot-blooded court action. Danganronpa’s original anime adaptation had a similar issue with pacing and went too fast to be understood. Ace Attorney does something similar, with not enough time being given to viewers to actually figure out the mystery. If I hadn’t played the games, I would not be able to follow the show. Another problem is that it just didn’t seem to have as much heart put into it. Important moments were glossed over, and exciting moments just felt half as big. It’s likely a problem with the direction and animation, and not that it was loyal to the source material (which it actually wasn’t completely). There’s an issue when the game’s static backgrounds and limited sprite images can generate more excitement than an anime adaptation of it. I also blame the show for not using the superb music from the games. It occasionally used it, but very conservatively. Anyway, my point is that I don’t think authenticity to source material alone makes an anime good or not. As long as it captures the spirit and is an enjoyable piece of work that fans can appreciate. Excellent points! I can definitely agree that Tales of Zestiria the X is slow, but I didn’t find myself frustrated with it. I’d prefer a slower show with character development and story rather than speeding through it. I also agree that the one-on-one battles in Zestiria are so awesome to watch! I wish there was more of them, less fighting giant monsters. I hope we get more single battles again because the action really shines in those! Yeah, Ace Attorney is very fast. I still need to catch up to see some other changes, but I agree that a lot of the jaw-dropping moments from the game didn’t happen here in the same way. Maybe it’s bias from playing the games first, but the moment when Phoenix has to defend himself in the game is HUGE, and in the anime, it’s just kind of glossed over. Very good point about the authenticity. It doesn’t matter if the execution isn’t great. That can vary from person to person, but being a good anime certainly comes first. I think Tales has the right idea, and while Ace Attorney is chock full of references to the games (like the dialogue boxes with the green text of the date and time), it doesn’t have the same impact or emotion as the games do.